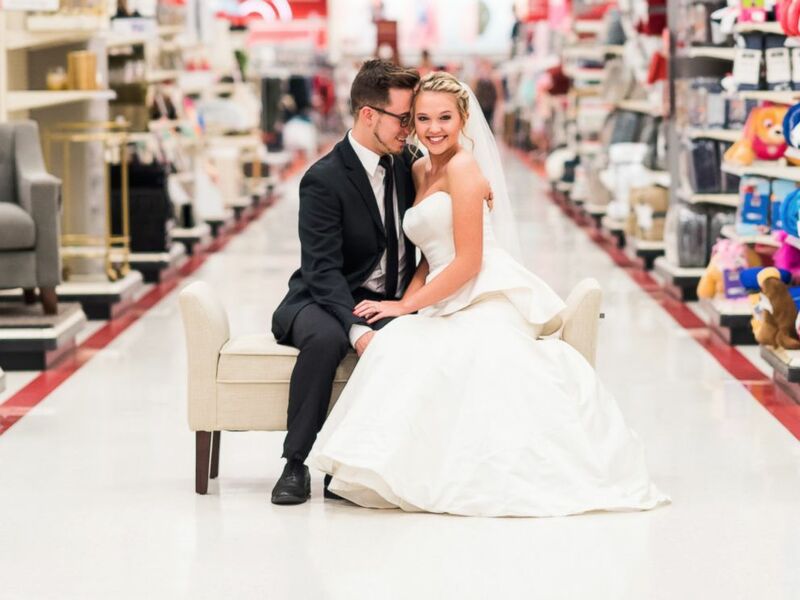 A West Virginia couple, Corey and Lauren Rexroad recreated their wedding photos inside their local Target to celebrate their anniversary. A West Virginia couple celebrated their one-year anniversary by recreating their wedding photos at their local Target store. Lauren Rexroad brainstormed how she and her husband, Corey, would celebrate their first year together last month. "Everyone does the same kind of outdoor shoot," Rexroad told ABC News, adding that she wanted her anniversary photos to stand out. Then she thought of how her husband proposed -- taking her to The Rink at Rockefeller Center in New York City. They were accompanied by professional wedding photographer Callie Lindsey, who captured the entire thing. Since then, Lindsey has photographed all of their milestones, including their wedding. So naturally, Rexroad, 22, thought to partner with Lindsey to mark her anniversary on Sept. 18. "Lauren is like a die-hard Target lover," Lindsey, 22, told ABC News. "She said that ... the only thing missing from their wedding photos was Target, her favorite place." "There’s not a lot to do in Morgantown," Rexroad added. "There’s a big hill and on top of that hill is Target. We are there all the time, especially being newlyweds and decorating our first home." So the two staged a photo shoot inside their local Target in Morgantown, West Virginia. And the store was more than happy to accommodate them. The only problem was getting Rexroad's husband on board. The newlywed said she had to talk him into it. "[I told him,] 'I’m going to try and get into my wedding dress and kind of recreate the day, but we’re going to go to Target,'" Rexroad recalled. "And he liked looked at me like, 'What?'" Soon, Corey Rexroad, 23, was on board and "thought it was hilarious," his wife said. The two-hour photoshoot had the Rexroads all over Target, including in the parking lot and the home goods section. "We also shot in the cafe. 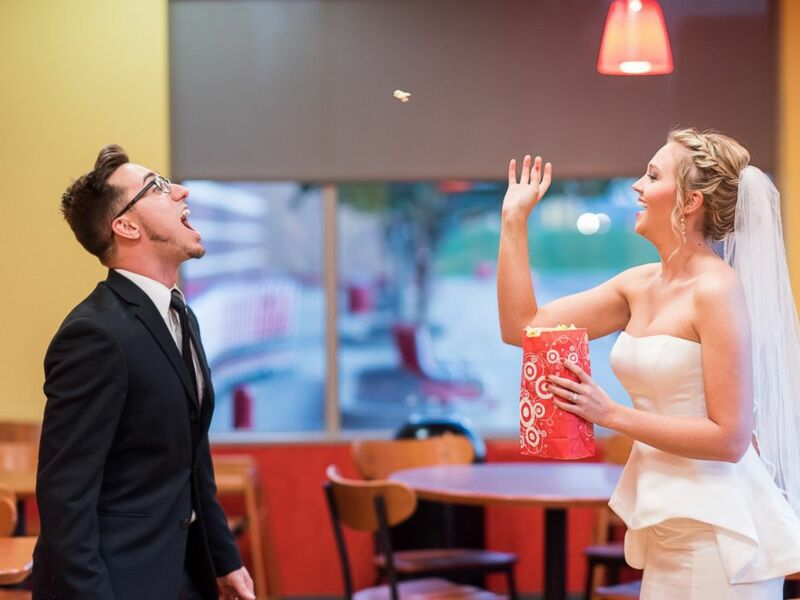 They fed each other popcorn," Lindsey added. "It was hysterical," Lauren Rexroad recalled of the photo shoot. "We got out of the car and as soon as I stepped out of the car I could feel eyes everywhere. People were like peeking out of their windows." The photos, shared on Instagram Wednesday, were so beloved that even Target got wind of them and shared one on its Twitter account Wednesday. Lauren Rexroad said she's now looking forward to life with her husband, including continuing to become adjusted to living together. "I have loved every minute of it; just waking up with him and just doing life with him," she added. "It's been so much fun."